HOUSTON – (March 5, 2018) – Lenses are no longer necessary for some microscopes, according to Rice University engineers developing FlatScope, a thin fluorescent microscope whose abilities promise to surpass those of old-school devices. The Rice team began developing the device as part of a federal initiative by the Defense Advanced Research Projects Agency as an implantable, high-resolution neural interface. But the device's potential is much greater. The researchers claim FlatScope, an advance on the labs' earlier FlatCam, could be used as an implantable endoscope, a large-area imager or a flexible microscope. 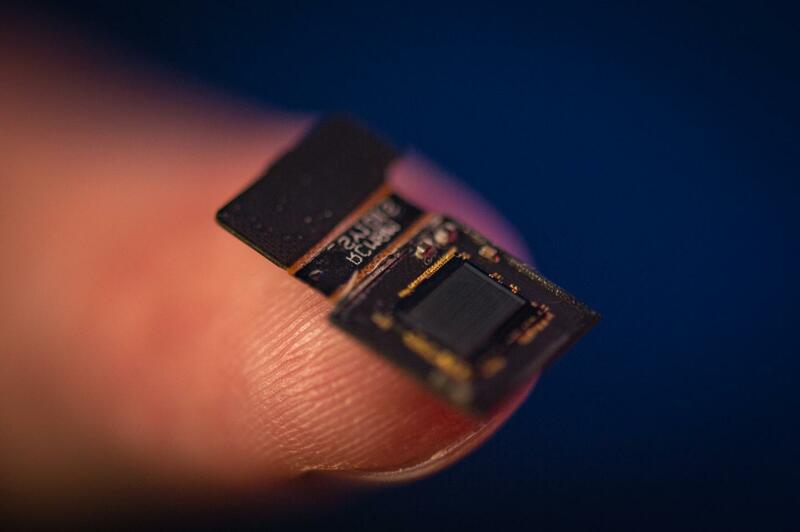 "We think of this as amping up FlatCam so it can solve even bigger problems," Baraniuk said. The Rice team takes a different approach. It uses the same charge-coupled device (CCD) chips found in all electronic cameras to capture incoming light, but the comparisons stop there. Like the FlatCam project that inspired it, FlatScope's field of view equals the size of the CCD sensor, which can be as large or as small as required. It's flat because it replaces the array of lenses in a traditional microscope with a custom amplitude mask. That resolution is what makes the device a microscope, Robinson said. "A camera in your mobile phone or DSLR typically gets on the order of 100-micron resolution," he said. "When you take a macro photo, the resolution is about 20 to 50 microns. "I think of a microscope as something that allows you to image things on the micron scale," he said. "That means things that are smaller than the diameter of a human hair, like cells, parts of cells or the fine structure of fibers." Achieving that resolution required modifications to the FlatCam mask to further cut the amount of light that reaches the sensor as well as a rewrite of their software, Robinson said. "It wasn't as trivial as simply applying the FlatCam algorithm to the same techniques we used to image things that are far away," he said. The mask is akin to the aperture in a lensed camera that focuses light onto the sensor, but it's only a few hundred micrometers from the sensor and allows only a fraction of the available light to get through, limiting the amount of data to simplify processing. "In the case of a megapixel camera, that computational problem requires a matrix of a million times a million elements," Robinson said. "It's an incredibly big matrix. But because we break it down through this pattern of rows and columns, our matrix is just 1 million elements." Veeraraghavan said the burgeoning internet of things may provide many applications for flat cameras and microscopes. That in turn would drive down costs. "One of the big advantages of this technology compared with traditional cameras is that because we don't need lenses, we don't need postfabrication assembly," he said. "We can imagine this rolling off a fabrication line." But their primary targets are medical uses, from implantable scopes for the clinic to palm-sized microscopes for the battlefield. "To be able to carry a microscope in your pocket is a neat technology," Veeraraghavan said.